In 1994, SkyStar aircraft was faced with an increasing demand to produce a significantly larger version of the Kitfox that would be able to utilize contemporary certified engines (Continental and Lycoming) in addition to the Rotax 912 engines. The answerer to this demand was the entirely new Kitfox Series 5. While appearing very similar to the Kitfox Classic 4, it is, in fact, a completely new design. The Kitfox Series 5 introduced a new marketing approach in which different variations of the Series 5 were given names. 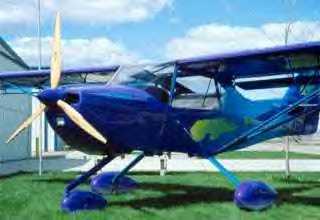 The tailwheel version became known as the Safari, and the tri-gear version (the first production tri-gear airplane based on the Kitfox design) was named the Vixen. The Vixen utilized a swept tail, a cosmetic change that did not affect performance. Originally introduced with a gross weight of 1400 pounds, the gross weight was increased to 1550 pounds in mid-1995. The handling characteristics became much more like those of contemporary certified aircraft, but lost none of the agility that had become a Kitfox trademark. As with all Kitfox aircraft, the folding wing feature was retained. In 1998, the name of the Safari was changed to the Outback, and the Vixen became the Voyager, but the basic features remained the same. A short wing version of the Series 5 was also sold, and it was known as the Series 5 Speedster. Although heavier and larger, the Series 5 is an aerodynamically cleaner design than the Classic 4 and cruises at a higher speed. The Series 5, and variations thereof, are a delight to fly. Refinements to the vertical tail surfaces and a new, trimable, horizontal stabilizer enhanced the pitch feel. The Series 5 has a “smoother” feel than the quick reacting Model 4, but retains the overall agility. Yaw stability is positive and good. The greater weight of the 1550 pound airplanes, coupled with the greater mass of Continental and Lycoming engines, causes the Series 5 to feel very much like a larger, heavier, certified airplane. This is not a surprise, as the Series 5, along with its tooling, was specifically designed to meet Primary Aircraft certifications standards. The tri-gear version of the Series 5 (Vixen/Voyager) is a contemporary nose gear airplane in all respects. The use of differential braking to steer the tri-gear airplane may take some practice, but offers unparalleled ground manoeuvrability. The larger engine choices result in a larger cowling and limited forward visibility during ground operation of the tailwheel version of the Series 5. Good tailwheel proficiency is suggested before your first flight of the “limited view” Series 5. Cruise flight in the Series 5 is nose low, resulting in very good in-flight visibility. Average empty weight 800 lbs. Average useful load 750 lbs. Length (wings folded) 22 ft.
Width (wings folded) 8 ft.